Everyone wants to know exactly how the take-out-bin-Laden-operation went down. Part of what we know for sure is that badass Navy SEALs did the shooting, and were carried to the site by another elite team—the 160th Special Operations Aviation Regiment, or SOAR (aka the "Night Stalkers"). 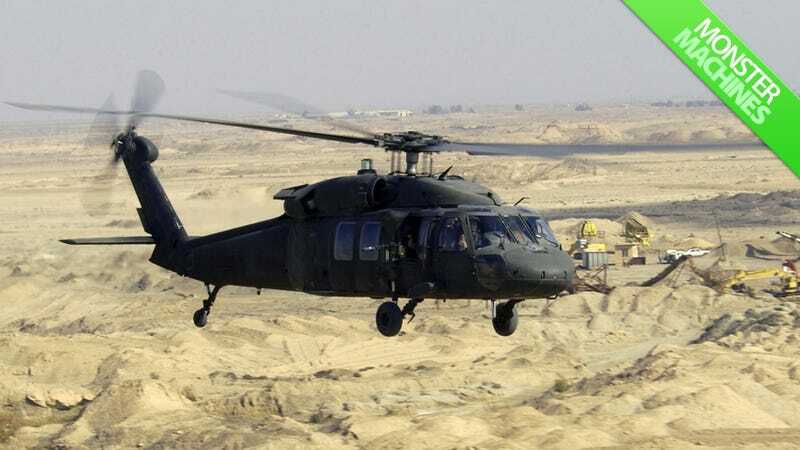 The bird of choice appears to have been specially modified MH-60 Black Hawk helicopters. The Night Stalkers are called upon for missions that involve direct assault, reconnaissance, or the insertion/extraction of special forces. They predominantly fly four helicopters: The MH-47E/G Chinook, MH-60L DAP, A/MH-6 Little Bird, and the MH-60K/L/M Black Hawk. The MH-60K Black Hawk is a beast. It carries 11 fully-equipped soldiers (or up to 22,000 pounds), travels at 183 mph and, thanks to its 230-gallon fuel tanks, can fly over 750 miles without refueling—and it's able to do so in all weather conditions. As if all that wasn't enough, the MH-60K is also capable of refueling in the air. The MH-60K packs some serious heat with a variety of options to choose from—Say, two M134 miniguns today? Perhaps an M230 30mm chain gun? How bout trying a GAU-19 gatling gun?